The following is an alphabetical list of the most commonly used terms in an Arizona Family Law case. These individual definitions are helpful should you have any questions about a specific term involved in your case. For a chronological explanation of a typical Family Law case in Arizona, click to either Divorce with children (Case Stages) or Divorce without children (Case Stages). 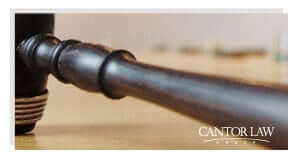 Although this website’s “Definitions” and “Case Stages” sections help to provide a general overview, it is highly recommended that you contact The Cantor Law Group immediately so we can provide a free initial consultation in order to discuss your individual case. In some states it was possible to receive an “Annulment”. This was a document that declared that the legal marriage never occurred in the first place. Arizona does not recognize Annulments, only “Dissolutions of Marriage” (i.e., Divorces). When one spouse wishes to move out of the area, or out of Arizona, and they wish to take the children with them, then very specific steps need to be undertaken. Normally, this issue is resolved in the initial “Child Custody” litigation phase. The Court will always look to the standard issues as to what is in the “best interest of the child”. All of the same issues will be explored as in any other “Child Custody” case. (See Child Custody (Permanent Orders)). If the divorce has already been finalized and the “Child Custody Permanent Orders” are already in place, then one party will be seeking a “Modification” of the initial visitation and Custody Orders. The judge will normally look to see if there is Sole or Joint Custody, and whether the purposes of the move is to frustrate the visitation rights of the remaining party. Obviously, Sole Custody moves are normally granted, whereas Joint Custody cases are normally litigated extensively. When litigation is necessary, the entire Child Custody issue will be re-examined as if the case were in its initial stages. Normally, the moving party must show a “substantial change in circumstances” which would justify the move (such as obtaining a new job which pays substantially more than the prior job; living with a terminally ill parent; being transferred for their job, or things of that nature). Simply moving in and of itself will not qualify as a “substantial change in circumstances”. At The Cantor Law Group, we have handled numerous “move away” cases for both the remaining spouse, and the moving spouse. Once Child Custody is “contested”, then the Court must first decide all other issues dealing with “Property Division” and “Spousal Maintenance”. In many cases, the spouses will have their attorney file a written agreement providing for “Joint Custody”. This is normally determined to be in the best interests of the child. This written agreement is normally called a “Joint Parenting Plan”. This plan helps to determine Custody issues and visitation schedules (i.e. for holidays, weekends, birthdays, etc.). The Judge will also determine whether Joint Custody is feasible (i.e. with regards to the distances in which the parents live apart, works schedules and things of that nature). In certain cases, the Court will order Joint Custody over the objection of one of the parents (this is not uncommon). In addition, the Court can order visitation rights to the grandparents if they have filed the proper paperwork with the Court. Courts generally wish to hear testimony by an expert witness when deciding Child Custody issues. In many cases, it is wise to do a “Custody Evaluation” or “Dispute Assessment” which includes a “Request for Appointment of Mental Health Expert”. The Mental Health Expert will conduct a variety of tests on not only the children, but also the parents. They will then interview the parents, children, and any other witnesses which may assist the expert on preparing his recommendation for the Judge. They are also allowed to use information from confidential sources when preparing their Report and providing their opinion. These Reports can either be agreed upon by the parties or the Judge can order the Custody Evaluation over both parties’ objections. At The Cantor Law Group, we have access to numerous expert witnesses who are available to best serve our clients and assist the Judge in making a determination regarding what is in the “best interests of the child”. Remember, the most important determination in awarding Child Custody (either Sole or Joint Custody) is what is in the “best interests of the child”. This is the way it should be! At The Cantor Law Group, we can help assure that all information that you wish to present to the Court regarding the “best interests of the child” are fully taken into consideration. In most cases when a “Petition for Dissolution” is filed, there is also a request for “Temporary Orders” regarding “Child Custody”. These are filed in order to maintain the status quo of where the children will live. This is done in order to prevent as much upheaval and turmoil in the children’s lives as is possible. The Court looks to what is in the “best interests of the child”. These Temporary Orders will generally address where the child will live, visitation, “Child Custody”, “Child Support“, and some form of a restraining order (i.e. to prevent the parents from “kidnapping” their own children). Temporary Orders normally take a couple of months to be heard by the Court. “Emergency Temporary Orders” can be requested by either party and normally will be heard by the Court within 24 hours. These Orders are normally based upon a showing of irreparable harm that may befall the children. Usually there is a child abuse, drug abuse or mental health issue involved in these cases. Many times these Orders are heard “Ex Parte” (i.e. with only one party appearing in front of the Judge). At the Emergency Order’s hearing, the Judge will base his information upon declarations and sometimes on brief testimony. A “Return Hearing” to determine the issues will be set within seven days of the Emergency Hearing. This gives the non-appearing spouse the chance to assemble their evidence in order to counter the allegations made by the Petitioning spouse. At The Cantor Law Group, we are very experienced at dealing both Child Custody Emergency and Standard Temporary Orders which will best protect your children. Child Support is normally determined by specific Arizona Supreme Court Guidelines. These guidelines are based upon mathematical formulas that look at numerous factors. These factors can include the incomes of the parties, the amount of time spent at each parent’s residence, and various debts and dues. 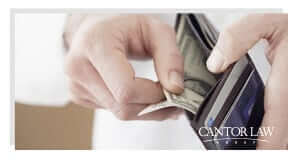 At The Cantor Law Group, we use a specially designed computer program known as “Cassandra”® which can quickly and accurately determine the amount of Child Support due to, or from, each spouse. When determining the amount of Child Support owed, income is normally the most important factor. This not only includes standard paycheck wages, but also bonuses, commission payments, overtime, disability payments, social security income, income from rental properties, and income from intellectual property such as royalties. The Court can also view stock option plans (which are non-retirement) as income. If one spouse is not working, the Judge can still assume that this non-custodial parent is capable of obtaining a job at minimum wage for 40 hours a week. Exceptions include if the parent is under the age of 18 years of age and is currently enrolled in high school, or if there is other evidence that is presented to the Court as to why an individual cannot work. If one of the spouses is self-employed, then normally very extensive “Discovery” is required to determine their true income. This is due to the fact that cash receipts are normally involved, and many personal expenses are covered as business expenses. It is important to have a knowledgeable law firm such as The Cantor Law Group to examine all aspects in order to accurately determine “true income”. Many times tax returns will not match the true income and a simple examination of a prior loan application (or other financial documents) will pin down a spouse as to what they were truly earning. All Child Support orders must assign one or both spouses the responsibility of paying for medical insurance coverage, and for payment of all non-covered medical expenses. In addition, any income of a new spouse or new significant other will not be considered as to whether one parent should be paying their obligation. In other words, it is irrelevant if your new spouse is a multi-millionaire, your old spouse still needs to pay for their Child’s Support. Don’t forget, Child Support orders can be “Modified” if there is a change in circumstance. 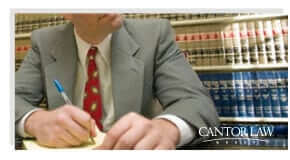 At The Cantor Law Group, we are very knowledgeable and have conducted numerous Modification Hearings. See Post Judgment Enforcement/ Modification). If the parties agree to a Settlement prior to going to “Trial”, they can file a “Marital Settlement Agreement” with the Court. This serves as a contract between the parties concerning all issues. This document is normally titled a “Stipulation to File Consent Decree”. It must be signed by both parties and filed with the Court (along with the “Decree of Dissolution”) for the Judge to review, grant, and sign. The Court will normally adopt all of the terms set forth in the Agreement, unless there are any glaring issues. It is common for a Consent Decree to occur when one spouse does not wish to fight the original “Petition for Dissolution”. 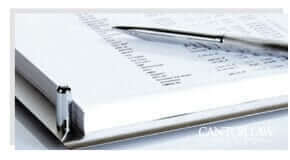 Before any Marital Settlement Agreement is entered into, you should seek the advise of The Cantor Law Group to make sure that you are not giving away any future rights which you did not anticipate. This Marital Settlement Agreement is often used to settle issues regarding “Child Custody“, “Child Support“, “Property Division“, and “Spousal Maintenance“. An “Uncontested Divorce” is basically one where your spouse does not file a “Response” to the “Petition for Dissolution”. This can either result in a “Default Judgment”, or they may have contacted you and simply entered into a “Consent Decree/Marital Settlement Agreement” without any official fight or “contest” taking place in Court. A “Contested Divorce” is one in which your spouse is “contesting” your Petition for Dissolution. By “contesting” the Petition, they will have actually filed a Response with the Court. The filing of the Response will not prevent a future Consent Decree/Marital Settlement Agreement from being reached. In fact, the most likely scenario is that they will Respond and then later work out an Agreement between your attorney and theirs. This usually occurs after “Discovery” has been concluded. If a Marital Settlement Agreement is still not reached, it is at this time that a Trial will occur. Many Courts will appoint attorneys for children (i.e. Guardian Ad Litem) if the Judge finds that the parent’s position may be in conflict with the “best interests of the child”. Sometimes this will occur if the child is insisting on being with one parent, although a Judge may feel that it conflicts with their best interest. This also helps prevent the parties from playing “tug-of-war” with their child. The Guardian Ad Litem may agree with 90% of what each attorney wants, but may disagree adamantly with the other 10%. He will then give his honest opinion and fight for what he believes to be in the “best interests of the child”. Many times this will result in a compromised position that satisfies not only the child’s best interest, but also the parents’ and the Court’s general wishes. This is the “Final Judgment” or “Decree” which will restore you and your former spouse’s status of unmarried persons. They will also set out the final rulings regarding “Child Custody”, “Child Support”, “Property Division”, and other important issues regarding the termination of the marriage. Some of these have specified effective dates, and others take effect immediately. (See “Final Judgment”). A “Default” occurs when a spouse is not “Responding” to the “Petition for Dissolution” within the required amount of time (20 days if your spouse is an Arizona “Resident”; 30 days for an out-of-state Resident). Once the time limit has run and if your spouse has failed to respond, you can then file for a “Notice of Default” with the Court. This has the effect of asking the Court to grant everything that you have asked for in your Petition. 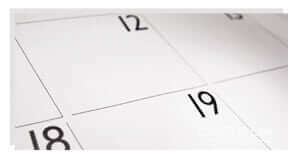 Once you have filed the Notice of Default, your spouse has 10 days in which to Respond. If they do not Respond, then your case will be assigned to a Judge to enter a “Final Judgment” in the form of a “Decree of Dissolution”. At this “Default Hearing”, you must be present at Court, otherwise the Judge cannot sign the Decree and give you your copy. This normally takes two to four weeks to occur. If the Judge does grant the Default, then the Defaulted spouse still has the ability to file a Motion and request the Court to Set Aside the Default Judgment in order to allow them to file their Response. If the Judge grants the “Motion to Set Aside the Default”, then the process restarts. If you are the person who has had a Default Judgment entered against you, it is important that you contact The Cantor Law Group immediately so that we can attempt to rectify the situation. “Discovery” is the term used to describe the process by which each party is allowed to examine all possible evidence that may support their claims. In Arizona, both spouses must disclose, in writing, all legal and factual grounds for their alleged defenses and claims. In the “Notice of Witnesses” they must disclose the name of all witnesses and exchange any documents that will be used at trial. If all items are not fully disclosed, then they may be precluded from being introduced at trial. “Interrogatories” are written questions that each party must answer in writing. “Depositions” are Court ordered interviews that are normally conducted with both attorneys present, along with a Court reporter. Sometimes one spouse will be present in the room to assist his/her attorney with expanding on any answers given by the other spouse or witness. A “Request for Admissions” is a written list of questions asking for very specific admissions that will save time in the preparation of the case (i.e. “are you the father of the child”, etc.). Lastly, a “Request for Production of Documents” is a specific request for certain documents that either side believes will be beneficial to their case. The importance of all of these Discovery tools is that they solidify all of the issues (on both sides) and help the case proceed more rapidly to a “Marital Settlement Agreement/Consent Decree“. Obviously, a Settlement Agreement is much more preferable than “Trial“. However, if a Trial is eminent, then all of these Discovery measures are absolutely necessary to secure the most favorable result to the parties. 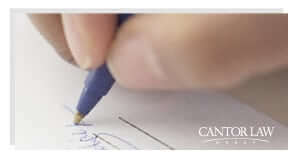 At The Cantor Law Group, we have an extensive computer database of Interrogatories and Deposition questions at our disposal. In addition, we have some of the most probing and thorough Requests for Production of Documents currently available within the legal field. In Arizona, marriages “Dissolve” after the conclusion of a “Dissolution Proceeding”. This used to be formerly known as a “Divorce”. “Irretrievably broken/ irreconcilable differences” is the only grounds which are recognized for “Divorce” in Arizona. It is not necessary to find that somebody is “at fault” for the “Dissolution”. All that is required is that one party wishes to get the Divorce. An “Uncontested Divorce” is basically one where your spouse does not file a “Response” to the “Petition for Dissolution”. This can either result in a “Default Judgment“, or they may have contacted you and simply entered into a “Consent Decree/Marital Settlement Agreement” without any official fight or “contest” taking place in Court. Once the Judge has reviewed all of the evidence, he will submit his “Final Judgment” in the form of a “Decree of Dissolution“. The document will normally address very specific issues regarding “Property Division“. Even though in a “Community Property” state, such as Arizona, assets should be divided down the middle, this is just in theory. In other words, one spouse may receive a more valuable asset in exchange for taking on more debt. Most commonly this occurs when one spouse takes over the house, but is now solely responsible for the large mortgage payment. Often times one spouse will be allowed to keep their pension or retirement plan in exchange for giving up another, more valuable asset. If the parties cannot agree on how to adequately divide these assets, the Judge can order the sale of certain assets with the proceeds to be distributed evenly. Naturally, “Child Custody” issues (i.e., what is in the best interests of the child) will control whether or not their primary residence should be sold. (See Child Support and Spousal Maintenance). This is the only grounds which are recognized for “Divorce” in Arizona. It is not necessary to find that somebody is “at fault” for the “Dissolution”. All that is required is that one party wishes to get the Divorce. (See No Fault). “Legal Separation” can either be temporary or for an unlimited period of time. This is a legal decree which is issued when the Judge determines that there is an irretrievable breakdown of the marriage, or that one spouse desires to live separate and apart from the other spouse. The benefit of the Legal Separation is that it still leaves open the possibility of “Reconciliation”, and it protects both spouses from the others future debts. One spouse files an objection to the Legal Separation, it will then be amended to a “Petition for Dissolution” of the marriage and the “Divorce” process begins. A Legal Separation will also resolve “Child Custody“, “Child Support“, “Property Division“, debt issues, visitation and other concerns. However, the marriage is still intact at the end of the process. The purpose of Legal Separations versus Divorce is normally for religious reasons and to keep alive the hope that one day the marriage may be salvaged. A wife’s former or maiden name can be changed back upon request in the “Petition for Dissolution”. When sitting down to prepare your Petition with The Cantor Law Group, simply ask to have your name changed back, and we will accommodate you quickly and efficiently. In some states it is required that one party be at “Fault” for the breakup of the marriage. This usually involves finger-pointing and claims of infidelity, drunkenness, domestic violence, and a host of other unsavory claims. In Arizona, it is not necessary to have somebody to blame for the end of the marriage, therefore, Arizona is a “No Fault Divorce” state. A “Paternity” action is a Court proceeding brought forward to determine and establish a parental relationship. It not only establishes parental rights, but it also establishes parental responsibilities. These actions can be brought by either the custodial or non-custodial parent, or by the Attorney General’s office/County Attorney’s office. The purpose of these actions is to determine “Child Custody“, “Child Support“, visitation, and state welfare reimbursement issues. It is not the purpose of these actions to determine the “Property Division” issues between unmarried parents living together. Once the Petition to establish a parental relationship is filed, it is normally the next step to request DNA testing to determine who is, or is not, the father. It is legally presumed that a man is the father of the child if he signed the birth certificate at the hospital after the child was delivered. However, if information is received at a later time indicating that person is not the father, he can always request DNA testing. Once the issue of Paternity has been finalized, then the Court can ask to make determinations regarding Child Custody, visitation, and Child Support. This will not automatically take place if it was the Attorney General/County Attorney who brought the Paternity action to seek welfare reimbursement. In such cases, it is normally necessary to file a separate action for determination of those issues. At The Cantor Law Group, we have resources to various qualified physicians and scientific labs that can conduct reliable DNA testing. A “Petition for Dissolution” is the first paperwork which is filed to begin a “Divorce” action. Along with the Petition for Dissolution a “Preliminary Injunction” will be filed. In addition, some women also file a request for “Maiden Name Restoration”. An “Order and Notice to Attend Parent Information Program Classes” will also be filed with the Petition. This is an official court order and failure to obey may result in Contempt of Court. What this means is both you and your spouse must complete these classes within 45 days from the Petition being served. Also, these classes must be completed before the Judge will finalize your “Decree of Dissolution”. Our paralegals will provide you with the “Parent Information Program Notice” which includes all information necessary on where to go, costs, how to sign up, and how to get final completion notices sent to the Court. Once all of these documents are filed with the Court, the Court will check to make sure the Petitioner has “Residency” in order for the Court to have “Jurisdiction”. One of the two spouses must live in Arizona for at least 90 days before the filing of a “Petition for Dissolution”. Once the Petition is filed, there is a 60-day waiting period after “Service of Process” on the other spouse before any “Divorce” can become final. Once a “Final Judgment” has been issued by way of a “Marital Settlement Agreement“, “Trial Judgment” or “Appeal”, then the parties are obligated under the terms of the “Decree of Dissolution“. If either of the spouses fails to abide by those terms, then the Judge can issue an “Order to Show Cause” as to why the Court should not hold that party in “contempt”. It is at this point that the Judge can issue sanctions ranging from simple monitary amounts, all the way to imprisonment. Another enforcement tool the Judge possesses are garnishments of one spouse’s wages to collect on past due “Child Support” payments. The Judge also has the power, in some cases, to revoke a party’s driver’s license or begin proceedings that would result in the loss of a professional license or certification. At The Cantor Law Group, we are familiar with all Post Judgment Enforcement and Modification issues and can help you immediately. In regards to “Modification”, many times one spouse’s circumstance will change and it is necessary to ask for a Modification of the prior “Decree of Dissolution”. This could be due to the loss of a job or reduction in income of one spouse, or health issues and medical bills which may arise due to the illness of a child. It is especially important to Modify the Decree of Dissolution if circumstances have changed and they are effecting the “best interest” of any of the children involved. Once the Judge’s “Decree of Dissolution” is filed, then certain time limits begin to run with respect to “Motions for New Trial” and “Appeals”. A Motion for New Trial must be filed within 15 days after the Decree of Dissolution is filed by the Judge. Otherwise this remedy will no longer be available. Motions for New Trial are very rarely granted due to the fact that they can only be supported by very specific grounds. If the specific grounds do not exist under the rules regarding a Motion for New Trial, then it is wiser to file an Appeal. The Appellate process starts with a “Notice of Appeal” that must be filed within 30 days after the Decree of Dissolution is filed. The grounds for Appeal can be based on many more factors than allowed for by the Motion for New Trial. The most common Appeal is based on the admission or exclusion of evidence over a Trial Attorney’s objection. These Appeals must be filed with the Arizona Court of Appeals. Many times the Court of Appeals will find that the Trial Judge committed an error, yet it did not rise to a sufficient level allowing them to overturn the “Final Judgment”. If the Court of Appeals does determine there was “harmful error”, then the case will be remanded back to the Superior Court for a New Trial. 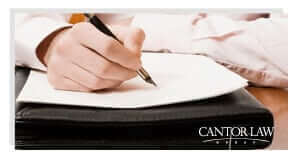 At The Cantor Law Group, we have extensive Appellate Court knowledge. Not only have some of our attorneys’ more significant cases been published in the Arizona case law reporters, but members of the firm have also argued various issues in front of the Arizona Supreme Court on numerous occasions. One of the first papers filed along with the “Petition for Dissolution” is a “Preliminary Injunction”. The Preliminary Injunction Order is the first ruling issued by the Court during the Dissolution proceeding. This prevents you or your spouse from selling or giving away any “Community Property” (i.e. it protects both of you). It also prevents either you or your spouse from taking your children without the prior written consent of the other spouse. Lastly, it prevents either you or your spouse from harassing or disturbing the peace of one another. 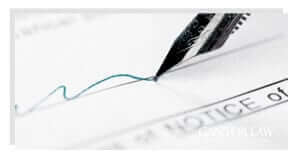 “Prenuptial” or “Premarital Agreements” are contracts that are entered into prior to the marriage taking place. These must be in writing and signed by both parties in order to be enforceable. The Agreement has to be entered into voluntarily, and it cannot be unconscionable when executed. In addition, both spouses must be fully informed and provided with fair and reasonable disclosure of all the property and financial interests and obligations of the other spouse. In other words, all of your information must be turned over to the other spouse and their lawyer. There is an exception if your future spouse voluntarily waives the disclosure of this information and had adequate previous knowledge of your financial holdings and obligations. It is usually best to have the future spouse sit down and review the Prenuptial Agreement drafted by The Cantor Law Group with the advice of their lawyer. If the Agreement terminates or Modifies “Spousal Maintenance” which results in that spouse being eligible for public assistance (i.e. welfare) then the Court may override the Agreement and still order one party to pay Spousal Maintenance. Ultimately, if the marriage is found to be void (for a variety of reasons) then the Agreement will only be enforceable to the extent that it avoids an inequitable result. If either spouse has a substantial net worth, it is always advisable to obtain a Prenuptial Agreement. In addition, if either spouse has children from a previous marriage, it is also advisable to get a Prenuptial Agreement. This can result in protecting your original children’s interests above and beyond that of a simple Will and Trust. At The Cantor Law Group, we can handle all aspects necessary to prepare an adequate Prenuptial/Premarital Agreement that will protect you and your family’s interests. Arizona is a “Community Property” State. “Separate Property” (property brought in prior to the marriage) is retained by the owner of the property. In addition, it is normally held that an inheritance and separate gifts are also to be considered Separate Property. It is the general proposition that all property and debt acquired during the marriage (including wedding gifts) through the joint resources or funds of the spouses, are considered to be “Community Property”. This includes property acquired by either spouse outside of the State of Arizona if that property would have been Community Property if acquired within the State of Arizona while married. Marital misconduct or “Fault” is irrelevant when dividing up the property. In addition, the fact that only one spouse may have held a job during the marriage is also irrelevant when dividing up Community Property. Community Property also includes pensions, benefits, stock plans, accrued vacation, deferred compensation, frequent flier miles, publishing rights, copyrights, patents, or anything else of value acquired during the marriage. The Court may also take into consideration the wasteful spending of Community Property assets, destruction of assets, and concealment or fraudulent transfers of Community Property when making the determination of the “Property Division”. Other issues examined by the Court include: length of the marriage; how much property is available for Division; the financial requirements of each of the parties based upon age, health, and children’s needs (see “Child Support“); education level and ability to obtain work and things of that nature. Under certain circumstances, the Judge can order repayment of Separate Property contributed to improve Community Property assets (i.e. inheritance money used to improve the house). Lastly, the Court has the ability to place a lien upon a spouse’s Separate Property in order to secure payment of things such as “Spousal Maintenance“, “Child Support“, or any other order under the Judge’s “Final Judgment” per the “Decree of Dissolution“. When one party strongly believes that the marriage can be saved, they can petition the Court to order marriage counseling. This order results in the Dissolution proceedings being suspended for up to 120 days while the Court determines whether “Reconciliation” is possible and likely. One of the two spouses must live in Arizona for at least 90 days before the filing of a “Petition for Dissolution”. Once the Petition is filed, there is a 60-day waiting period after “Service of Process” on the other spouse before any “Divorce” can become final. In regards to “Legal Separation”, there are no “Residency” requirements specified and that action can be filed at any time after one spouse establishes Residency within the State of Arizona. Once a “Petition for Dissolution” is filed with the Court, the “Petitioner” must have the “Summons” and other required documents and notices Served on the “Respondent”. The best way to achieve “Service of Process” is to use a private Process Server. Once your spouse has been Served, they must “Respond” to the Petition within 20 days or the Court may grant all relief you have requested (i.e. a “Default Judgment”). If you are the person who has been served by your spouse, you need to contact The Cantor Law Group as quickly as possible. “Property Division” rights and “Child Custody” are at issue and need to be dealt with immediately! “Temporary Orders” differ from a “Preliminary Injunction” in that Temporary Orders are issued by the Court to lay some ground rules for the parties. These Temporary Orders may apply to who should live in the primary residence, whether “Spousal Maintenance” (i.e. Alimony) will be involved; who will pay the bills and by what percentages; where the children will reside, and things of that nature. Many times these Temporary Orders will evolve into “Permanent Orders” should the parties agree (i.e. by way of “Consent Decree/Marital Settlement Agreement“), or should the Judge order them after a “Trial” is concluded (i.e. “Final Judgment“/ “Decree of Dissolution“). After all “Discovery” has been completed, then the lawyers will sit down and attempt to negotiate a “Marital Separation Agreement/Consent Decree“. If this is not possible, then they will file a document with the Court to have the case set for “Trial”. Most cases normally take one or two days for Trial, however, more complex cases involving “Child Custody” and/ or large amounts of assets may take up to a week in length. Divorce Trials in Arizona are done without a jury, and are called “Bench Trials”. The Judge hears all of the evidence and then issues a “Final Judgment” in the form of a “Decree of Dissolution“. The “Petitioner” is the first one to proceed and present evidence at Trial. This is called “Direct Evidence”. Once the Petitioner and the Petitioner’s witnesses have presented their evidence, then the “Respondent” spouse’s attorney is allowed to “cross-examine” the witness with regards to their statements. After being cross-examined, then the Petitioner’s attorney gets a second chance and conducts “redirect examination”. Once all of the Petitioner’s witnesses have testified, then the Respondent spouse will present their evidence. They will do this through “direct evidence” testimony and then they will be “cross-examined,” followed by a final “redirect examination”. Each side has the burden of presenting to the Judge by a “Preponderance of the Evidence” that their claims are justified. Preponderance of the Evidence means that a fact is more likely than not to be true. This means that scales just barely tilt in a party’s favor to determine an issue. (i.e. 51%). During the Trial, both the Petitioner’s attorney and the Respondent’s attorney have a chance to “object” to evidence or testimony. If no objection is made, then there will not be a “record” preserved for purposes of an “Appeal” at a later date. (See Post Trial Remedies). 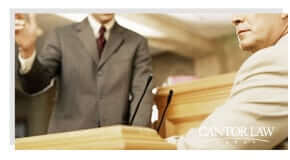 It is important to have a knowledgeable Family Law attorney who is skilled at the art of Trial advocacy on your side. 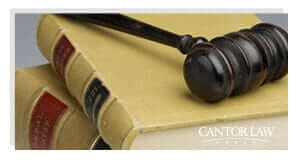 At The Cantor Law Group, we have extensive Jury and Bench Trial experience resulting in our being highlighted in the Bar Register of Preeminent Lawyers®. After all evidence has been presented, then the Judge will ask for “closing arguments”. It is at this time that both sides have a chance to summate their client’s position and argue that they have satisfied their burden of proof. The Petitioner’s attorney is allowed to argue first, and the Respondent’s attorney is allowed to argue last. The Judge will normally take the case “under advisement” and issue a written ruling at a later date. It usually takes only a week or two for the Judge to make a ruling, however, he or she has up to 100 days by law in which to submit his or her “Final Judgment” and “Decree of Dissolution“.